The scientists on the Mid-Atlantic Microbial Expedition have been working hard to answer two fundamental questions central to the mission of Expedition 336: What is the nature of microbial communities harbored in young ridge flanks and what is their role in ocean crust alteration? Where do deep-seated microbial communities come from? During Expedition 336, basement was cored and wireline-logged in Holes U1382A and U1383C. 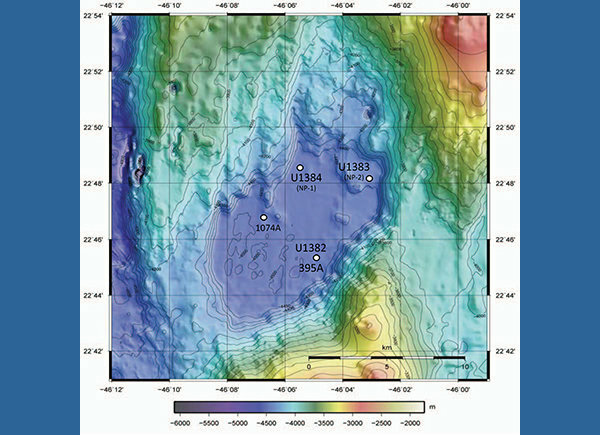 Upper oceanic crust in Hole 1382A, which is only 50 m west of Hole 395A, was cored between 110 and 210 m below seafloor (mbsf). 359.4 meters of core were recovered in 80 cores: 33 advanced piston corer (APC), 5 extended core barrel (XCB) and 42 rotary core barrel (RCB) cores. A total of 12222 samples were taken during Expedition 336. 1121 shipboard and 11101 personal samples were taken. A total of 936 whole round samples were taken. Of these whole round samples, 130 were for IW (Interstitial waters or pore water) samples, 131 for microbiology, and the remaining as personal samples. 100.31 meters of basement rock were prepared for microbial analyses on shore. What is the nature of microbial communities harbored in young ridge flanks and what is their role in ocean crust alteration? Living things are all made up of carbon-based molecules, so life on earth can be measured by the amount of organic carbon present—the carbon biomass. Scientists estimate that microbial cells in the deep ocean sediments account for up to 1/3 of the global carbon biomass. The rocky ocean crust, however, provides about ten times more habitable space for microbes than the sediments that lie just above it. Imagine how much microbial biomass may be hidden in the porous rock! New oceanic crust is continuously being formed along ridge systems like the one in the mid-Atlantic, bringing up heat energy from deep inside the Earth. In many of these global ridge systems and the surrounding areas (called flanks), interactions between the microbes and the water and rocks they inhabit can significantly change the composition of the oceans and crust, but scientists don’t know exactly how they work. The 26 Scientists from Expedition 336 will be analyzing samples taken from the rocky oceanic crust to find out what kind of microbes are present, where they live within the seafloor, and how they interact with their environment. They will be sequencing DNA and RNA molecules to identify the microbes present, counting how many microbes are there, and trying to grow the microbes using different food and energy sources to see how they interact with their environment. In addition, Expedition 336 installed fully functional subseafloor observatories in two newly-drilled holes (U1382A and U1383C) and placed an instrument and sampling string in an exisiting hole (395A). Scientists will be returning to download data and collect water samples from these observatories over the next few years. Where do deep-seated microbial communities come from (sediment, rock, seawater, other)? Scientists know that there are diverse microbiological communities that live in deeply buried marine sediments, but they aren’t sure where the microbes originally came from. It’s possible that the microbes originally came from the overlying bottom seawater, and continuously get buried as the sediments get deeper. On the other hand, microbial colonies may have come up from fluids in the rocky crust below, or from adjacent, older sediments. Expedition 336 scientists will analyze the microbial communities in both the deep sediments (obtained from cores taken during the expedition) and the basement crustal fluids (obtained with the CORK observatories after the expedition) to try to discover where they come from.